The 2016 Beetle Dune coupe will arrive this spring and has made its debut at this year’s Canadian International Autoshow in Toronto. Inspired by the classic Baja Bugs of the sixties and seventies, the Beetle Dune has a new look thanks to the fitment of new front and rear fascias and pronounced black wheelarch extensions that flow into the bumpers. Additionally, the Dune comes with 10 mm increase in ride height and a body track that is 14 mm wider. Highlighting the front end’s new look is a bumper featuring a large central air intake that widens towards its bottom edge. A black honeycomb screen with an aluminum-look surround morphs into the front skid plate. On either side of the intake, two black honeycomb vents contain the foglights. Bi-Xenon headlights with LED Daytime Running Lights and LED rear lighting are also part of the package. Polished aluminum sills and black trim strips are reminiscent of the original Beetle running boards. Distinctive 18-inch “Canyon” aluminum-alloy wheels, black and silver coloured side mirrors, and “Dune” graphics on both doors are included. A large rear spoiler, a rear bumper design that integrates matte black and aluminum elements, and a rear diffuser that also acts as a skid plate finish off the look. Inside, the 2016 Beetle Dune features sport seats with contrasting orange stitching and a leather-wrapped multifunction steering wheel. Standard equipment includes the 6.3-inch Composition Media infotainment system with capacitive touch sensor, USB and Bluetooth® connectivity, and “App-Connect” technology, allowing integration with the three major smartphone platforms-Apple CarPlay®, Android Auto™ and MirrorLink®-for seamless integration with compatible smartphones. KESSY® keyless access with push-button start, and a tilt-and-slide panoramic sunroof are also standard. The 2016 Beetle Dune will be available in three exterior colours: Sandstorm Yellow, Pure White, or Deep Black Pearl. Sandstorm Yellow cars feature body colour upper door trims and dashpads, whereas the Pure White and Deep Black Pearl vehicles have black door and dashpad trim. 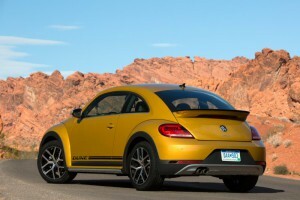 The Beetle Dune will be equipped with a 1.8-liter direct-injection and turbocharged TSI® four-cylinder engine, offering 170 horsepower and 184 pound-feet of torque, mated to a six-speed automatic transmission. Other than the choice of colour, the only option on the car will be a technology package, which will add a touchscreen navigation system, an 8-speaker, 400 watt “Fender” sound system and blind-spot detection. 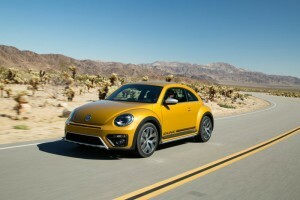 VW’s 2016 Dune Buggy comes in a choice of Sandstorm Yellow, Pure White, or Deep Black. The Beetle Dune is on sale now for spring delivery with a starting price of $26,990.